A raid on an Islamic State cell in southeastern Turkey left two Turkish police officers and seven militants dead Monday, as authorities pressed their effort to combat the extremists based across the border in Syria. The firefight occurred as police raided multiple houses Monday in the mainly Kurdish city of Diyarbakir. Security officials said five police officers were wounded and 12 militants were captured. Turkish authorities have blamed the Islamic State group for a double suicide bombing in Turkey's capital, Ankara, earlier this month that killed more than 100 people. One witness to the clash Monday told VOA's Turkish service that the fighting began in the middle of the night. "Smoke was coming from this locations behind me," the witness said. "Allahu-akbar sounds coming from the flats the police raided, I don’t know who they were but I guess they were ISIS militants. When we went over there to look afterwards, there was a body lying on the ground, covered with newspapers. Everywhere was riddled with bullet holes." Turkey is hosting about half of the 4 million Syrian refugees who have registered with the United Nations after fleeing Syria. The number of Syrians in Turkey has more than doubled since this time last year, adding to the strain the Syrian conflict has placed on the country's neighbors. Syrian President Bashar al-Assad on Sunday reiterated his focus on eliminating the threat of terrorists in Syria, saying that would lead to the political solution people in his country want to end the crisis that began there in March 2011. Russia, supporting the Syrian government with an air campaign against rebels opposed to Assad, said Monday that in the past day its forces launched 59 strikes on 94 targets in Hama, Idlib, Latakia, Damascus, Aleppo and Deir al-Zor provinces. 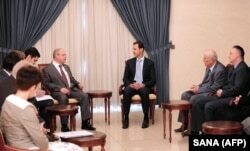 Assad met Sunday with a group of Russian lawmakers and other officials in Damascus, and the state-run SANA news agency said the president stressed that taking out terrorist groups would preserve Syria's sovereignty and its territorial integrity. The Russian Foreign Ministry said Sunday that U.S. Secretary of State John Kerry and Russian Foreign Minister Sergei Lavrov discussed in a phone call the "prospects" for an internationally-backed political settlement in Syria that would involve Syrian authorities and "patriotic opposition." Since then, Islamic State militants seized large areas in eastern Syria, including the group's de facto capital in Raqqa. About 30 percent of the more than 240,000 people who have been killed in the Syrian conflict have died since the vote, while the United Nations registered another 1.3 million refugees who fled the country.